There are some obvious advantages from traveling off season, for example flights and accommodations being much, much cheaper, less crowds around and shorter queues to museums and restaurants. And I have traveled “off peak” a few times now to be able to affirm that is, by far, my favourite way to see places. I love avoiding the rage of cheap airlines’ hostess if my hand luggage is 0.8cm longer than allowed, or having that extra sit in between me and the next fellow passenger where we can both put our stuff. I love peace and calm. It might well be because I live in one of the most populated cities in the world, but when I travel, I don’t want to have the same stress I have at home. I want to be able to find peace in a peaceful place. Anyhow, having said that, when you go to Santorini off season is totally different. It is like being on a movie set but before the stars and director arrive. It’s like being there with the scenographers, the costume designers, make-up crew, before the start day. Everything is getting a fix, a new layer is being put, the set is being finalised: walls are freshly painted in white, doors and windows fixed, steps and stairs re-done. Wherever you look, there are painters and handy men doing their things. And there no actors (aka= tourists) whatsoever. I mean to say the complete truth, while I was in Oia, there were 8 (eight) other people, clearly not locals, who were also exploring the beautiful island in an awkward (or less popular?) time of the year. It was just fantastic! Can you imagine having one of the most famous islands in the world just for yourself (and very few others)? Well, that’s the feeling when you go to Santorini in January. The advantages are others too. A friend of mine who was there with me this week, who also visited it in the summer, said it was impossible to take a singular picture without head, arm, leg or a** of someone suddenly walking in front of your camera. She also told me that on some spots it was necessary to queue for 40/50 minutes to take that specific, famous pic. Now, I ain’t a patient person, that wouldn’t have gone done well with me at all. I would have skipped the picture and gone home without. A local we met told us, like it’s written in the Frommers guide to forget about Oia postcards-looking sunsets during the summer as there are too many people and it’s impossible to get a nice spot, unless, of course you are lucky (and rich) enough to have rented a cave house with a terrace or you are staying at one of those luxurious hotels with a swimming pool on the balcony. Well, I got both in January: one of the most amazing accommodation I ever stayed (in one of the typical cave houses), with a stunning view of the Caldera, the sunset and the rest of white & blue Oia, for a very, very reasonable price. On top of this, I also got the sun and the warmth, of course not the summer warmth, but warm enough to walk around in my t-shirt and get a shy tan on my face too. There are obvious, but small, disadvantages too, I’m honest: for example there were only two restaurants and one bakery open in Oia. But hey, I hate taking decisions and having too much choice, so while we were there we made sure to try both and choose our favourite without too much thinking. If you are not a minimalist like me, and love your shopping while on holiday, you probably would go mental staying in a place where there are no shops open. But for me, being totally uninterested in buying touristy crap, it wasn’t an issue at all, I actually didn’t miss it at all. Fira, being the capital is a completely different story: shops, bars and restaurants were mostly open, the choice was much harder and longer, but we easily decided to have a very long lunch at Cafe Classico, one of the best views in the whole island. Food was lovely, local white wine too, the view spectacular and we also managed to had a nice chat about the island with the owner as he only had other few guests while we were there. The other thing I love while traveling off season is that locals have time. They are naturally inclined to spend more time with visitors, they aren’t stressed by the queues I was mentioning above and oftentimes they are willing to sit down at your table to share some funny or interesting facts about their city/island/village as it obviously happen in Santorini. It’s is a unique advantage you can never get in the hectic months of the summer and the one I love the most: being able to connect with the locals and scratch under the surface to understand the place and the people I’m visiting. That’s the difference between being a tourist and traveler, I believe and I obviously put myself in the second category. Holidays for me is time away from the “digital society” too. If I’m travelling solo, it’s the opportunity to connect with locals and meet other travellers, if I am with friends, like this time, it’s our chance to have quality time together. So it was this time too: I would only connect to post a couple of pictures and make my friends around the world jealous (joking! Or maybe not… ) But I knew, from experience, that all the rest could wait and so it did wait this time too. The last two days of our trip were spent in Athens, Greece capital, a city pregnant with history and social differences. It was there, outside the idyllic, almost-fake-looking Santorini, that I realised the poor state this country still is. Not only looking at the fading facades or scrappy buildings, but mainly looking into people’s eyes and faces. If you, like me, are an alert observer, you could see and feel the general resignation, disappointment, delusion and defeat that soaks Greek people on Athens streets. Greece is not just ancient history, you must remember that its legacy had and has an incredible influence on our current global culture. Think of the Olympics, but also of philosophy, theatre, fashion and not lastly, democracy, possibly the most important heritage they left to the modern world. I was walking among the ruins where this word was born, and I was thinking about its origins : in Greek is “δημοκρατία” which combines the elements demos (δῆμος, which means “people”) and krátos (κράτος, which means “force” or “power”), basically “people power”. If you think that these ideals of fairness, personal freedom and ultimately governance by the population itself where born in the 5th century b.c., it is quite breathtaking and impressive. As I was thinking all of this, it was also shocking to realise that Greece was, very unfortunately (and very similarly to my own home-country, Italy) let down by its own democratic government which spoiled itself with huge and unacceptable public spendings for decades. Since the global financial crisis which hit Greece in 2009, the Greek demos has been suffering six straight years of steep decline only rescuing 0.8 GDP growth last year. I really wish Greece the best with these new election at the end of the month. I really hope this amazing country will find the way to its glorious and shining previous outlook. I wish the stunning beauty and history that surrounds its cities and islands will help the Greek people to look up and find their smile again. I’d love to hear your thoughts on traveling off/on season, but I’d also love to hear your ideas on past, present and future Greece. Live More. Do More. Be More. 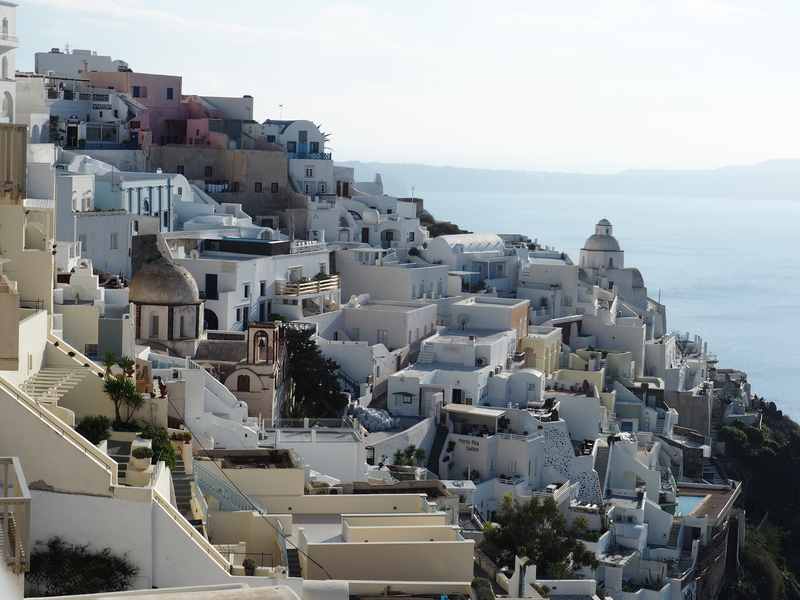 More picture from Santorini & Athens here. For bookings and enquires please use the email above.